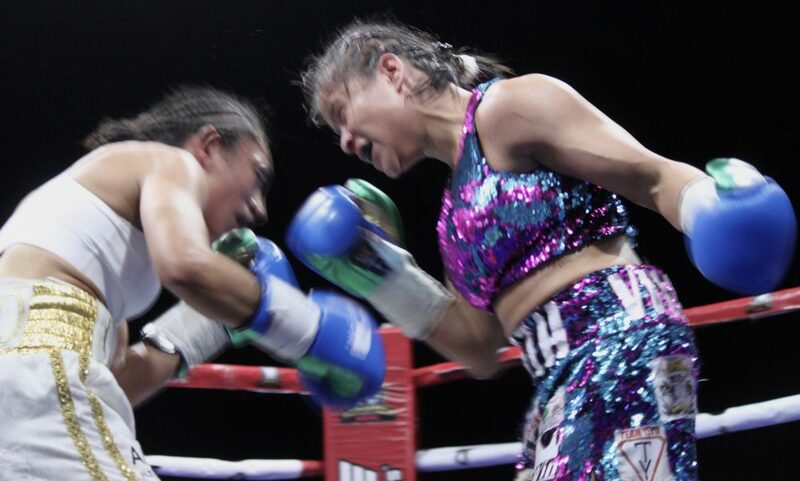 On Friday evening, the Big Punch Arena in Tijuana hosted another unforgettable night of boxing, the latest offering from Borizteca Boxing Promotions. 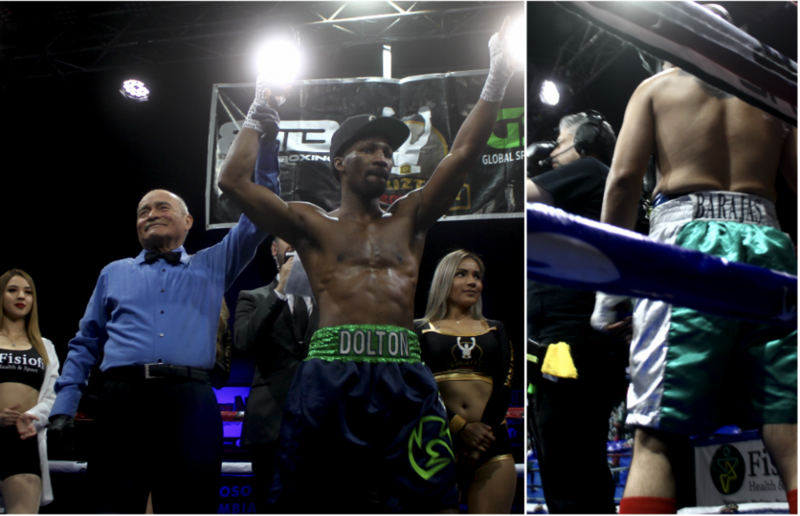 In the Main Event, they had 29-year-old welterweight Domonique “3D” Dolton (20-2-1, 11 KOs) (left) from Detroit, Michigan, Global ID #449534 going up against 34-year-old tough guy Ramon “Cholo” Barajas (12-16, 5 KOs) Global ID 536047 (right) from Tepic, Nayarit, Mexico, in a bout which had been moved up on the Bout Sheet to Bout #5 to suit viewers watching the live feed in Eastern Standard Time by way of their Global Sports Streaming Live broadcast Best In Boxing. After a bit of unappreciated showboating by Barajas, Dolton went hard and fast at his opponent catching him with a big overhand right to send Barajas to the canvas. 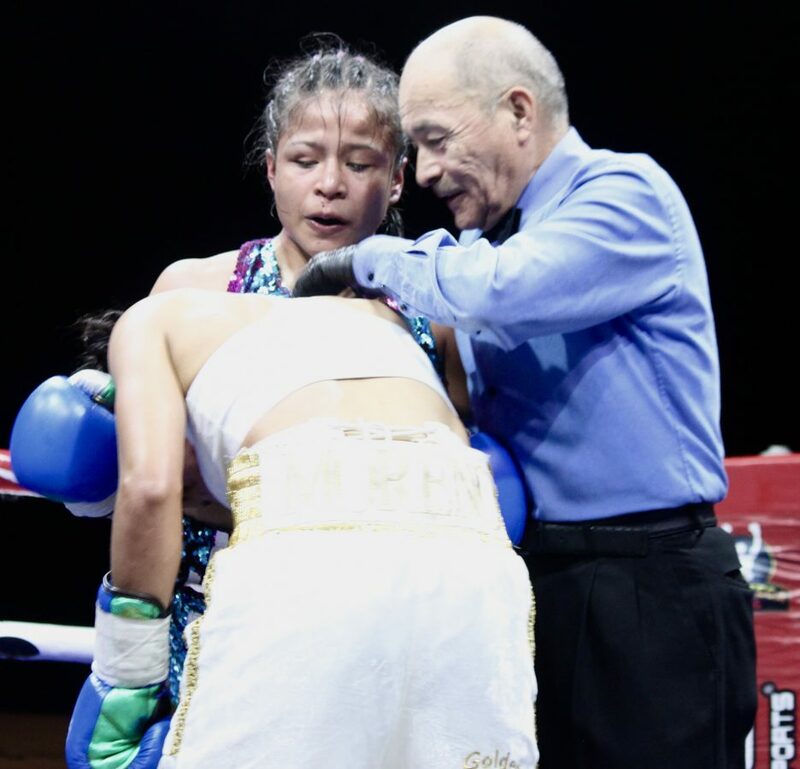 When veteran referee Juan Morales Lee, saw a look of confusion on Barajas’ face, he immediately called for an end to the fight. Barajas, who had been so fired up about his opportunity to fight a guy of Dolton’s stature, realized Lee’s ruling, he immediately became distraught and vehemently protested. However, Barajas’ protest fell on deaf ears and into the record books went Dolton’s 21st victory and Barajas’ 17th loss. 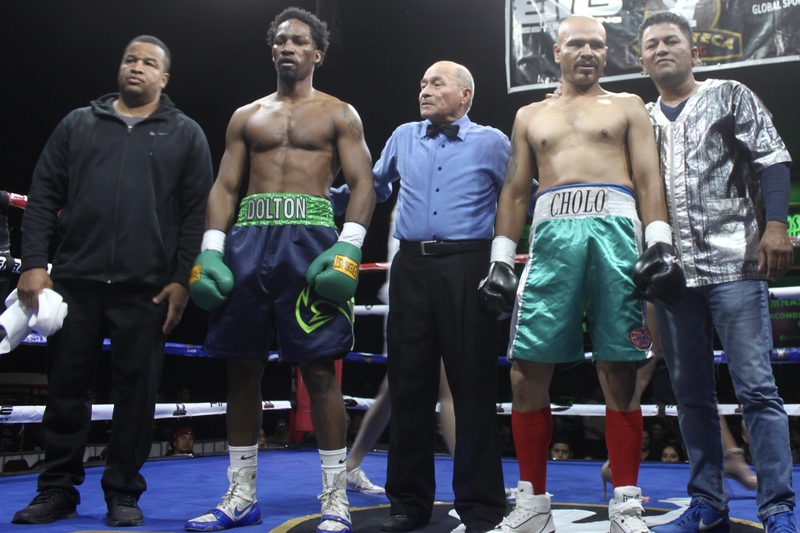 At first, Ramon Barajas (r) refused to accept the ruling and remained in his corner while referee Juan Morales Lee went ahead and raised the arm of the victorious Domonique Dolton. 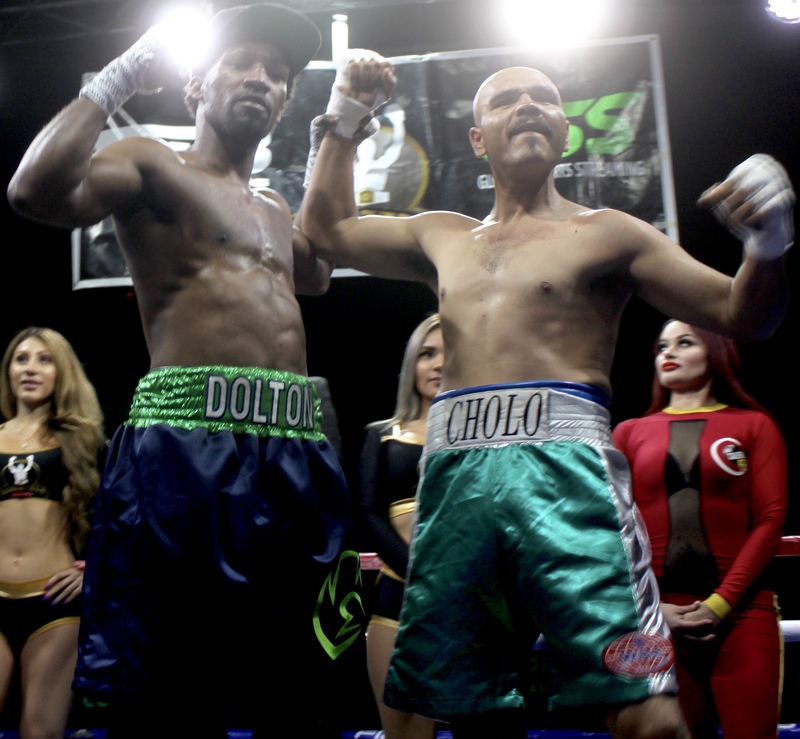 After cooler heads prevailed, Dolton (l), demonstrating good sportsmanship, approached Barajas (r) and talked him into returning to the center of the ring to receive his proper recognition from the fans. 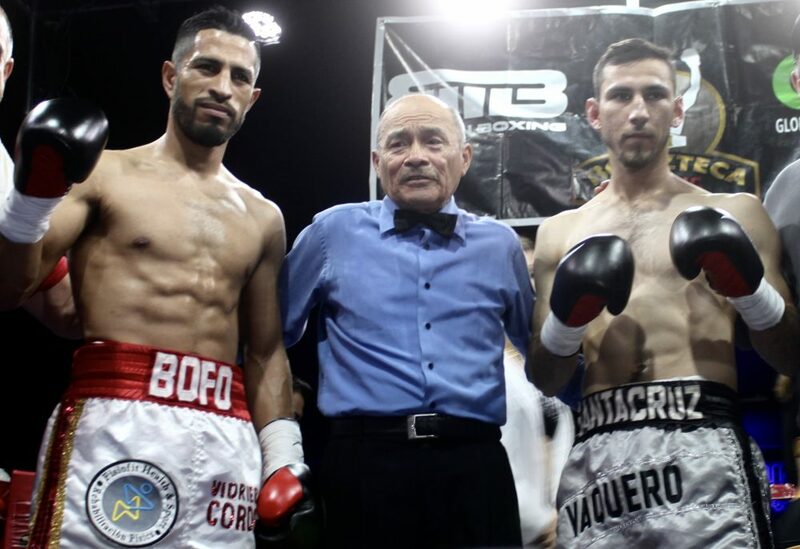 Bout #1 had super featherweight, 29-year-old, 5’6″ tall Giovannie “Golden Bear” Gonzalez Global ID 791016 (6-3, 6 KOs) from Lodi, Calif. (left) facing 20-year-old Federico “Fede” Rodriguez from Tijuana, B. C., Mexico, Global ID 800725, 1-10, 1 KO, (right) a victim of 9 knockouts who turned pro at age 18. 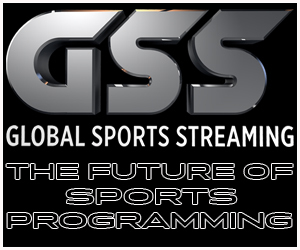 Here we had two pro athletes with differing perspectives on how to succeed in the sport. From the opening bell, Rodriguez’s strategy involved being elusive and wearing his opponent out, believing in the later rounds he’d be in a better position to counter with harder shots and then hopefully knock his opponent out. Gonzalez’s strategy differed like night and day. He went full bore from the opening bell and like boxing great Mike Tyson, his plan involved putting Rodriguez on his back. 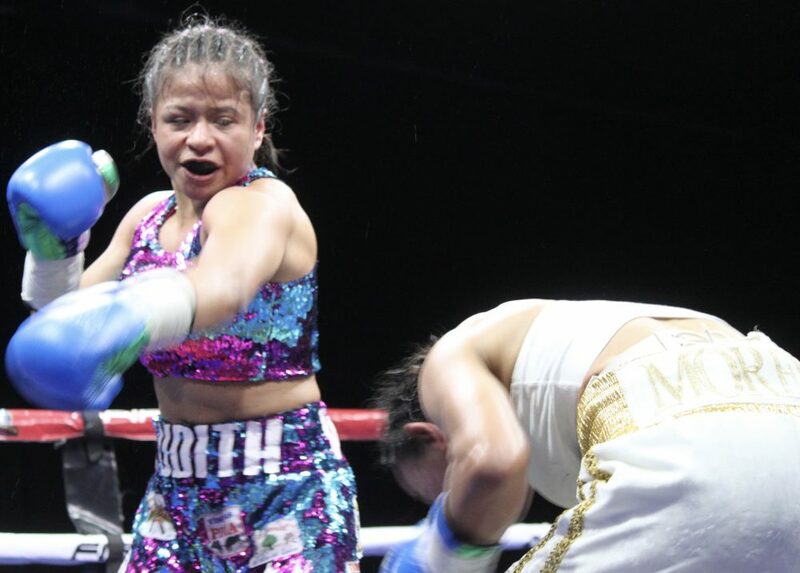 With this being a four rounder and Gonzalez in shape to go 10, there would be no denying Gonzalez the victory, either on points or a stoppage. Now comes this query, who do you think became the crowd favorite? 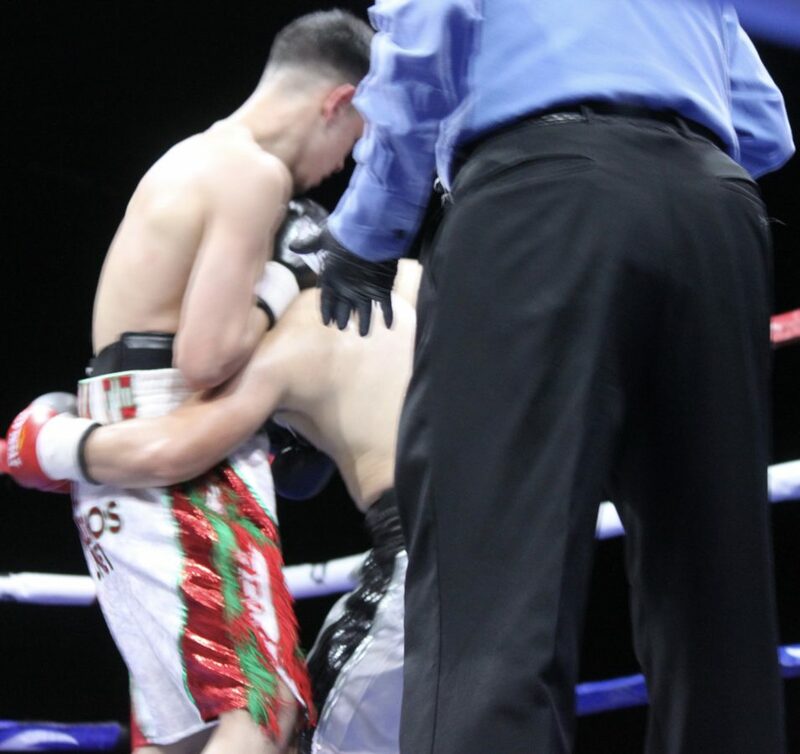 That distinction eventually went to Rodriguez who on multiple occasions fascinated the crowd by ducking under the harder Gonzalez punches to land a surprising number of slick counters. In the end, the decision was an easy one for the judges. 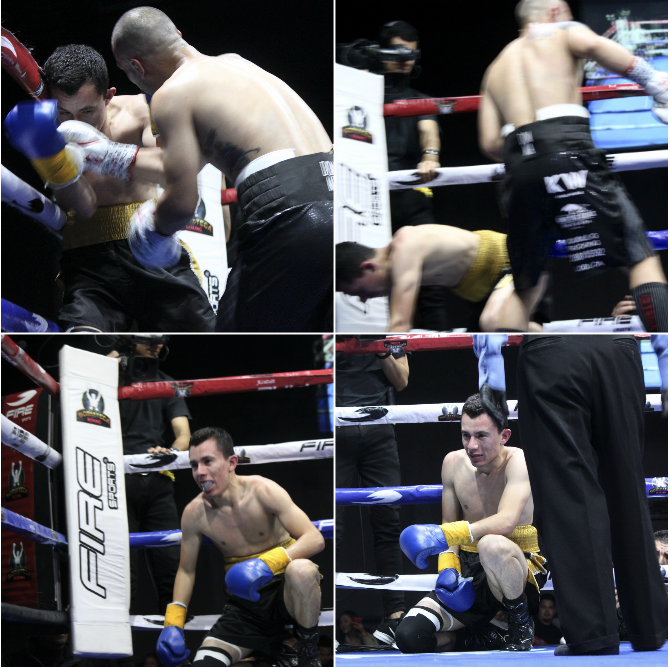 Gonzalez had without question landed more of the (harder) blows plus he managed to score a knockdown in the final round. 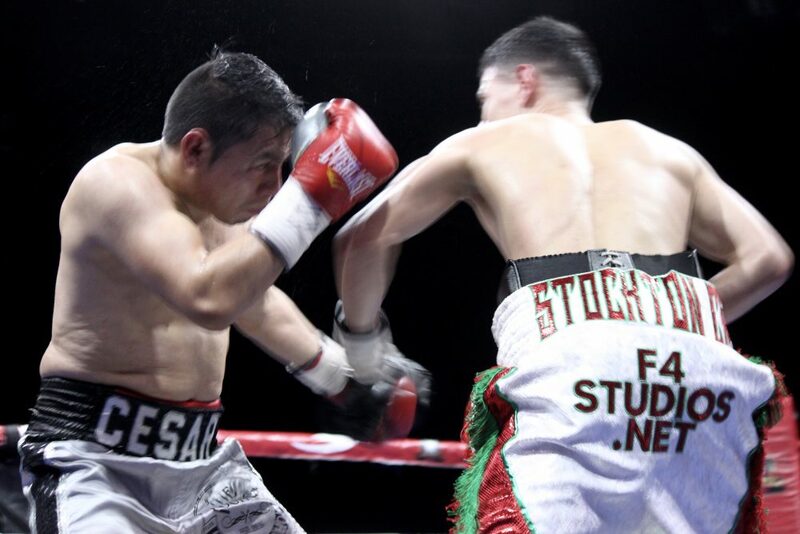 In that final round, with his known propensity towards being KO’d, on nine separate occasions, you could see the crowd started rooting for Rodriguez and his ability to withstand Gonzalez’s hard shots. With its fair share of drama, Bout #1 was a crowd pleaser. 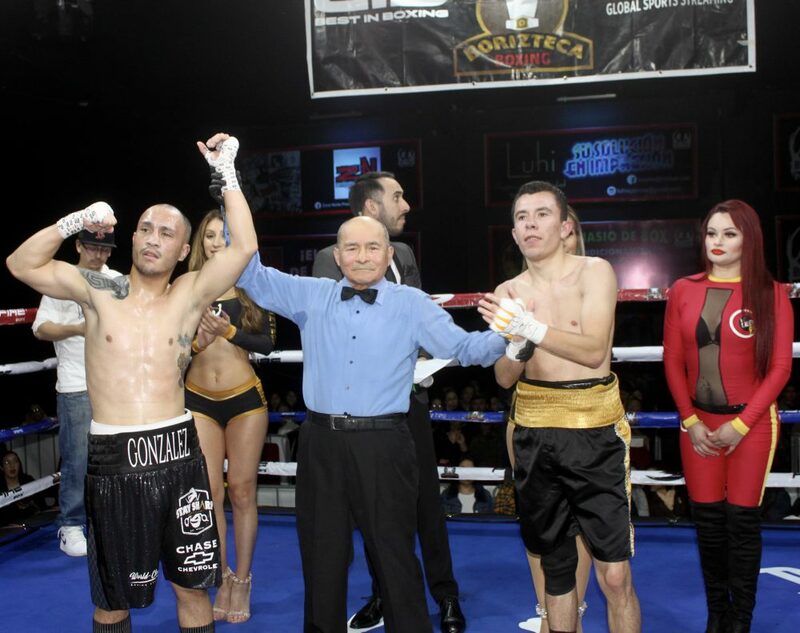 In the end, we see Giovannie Gonzalez (l) having his arm raised in victory by veteran referee Juan Manuel Morales Lee. In Bout #2, we got to see 235 lb. 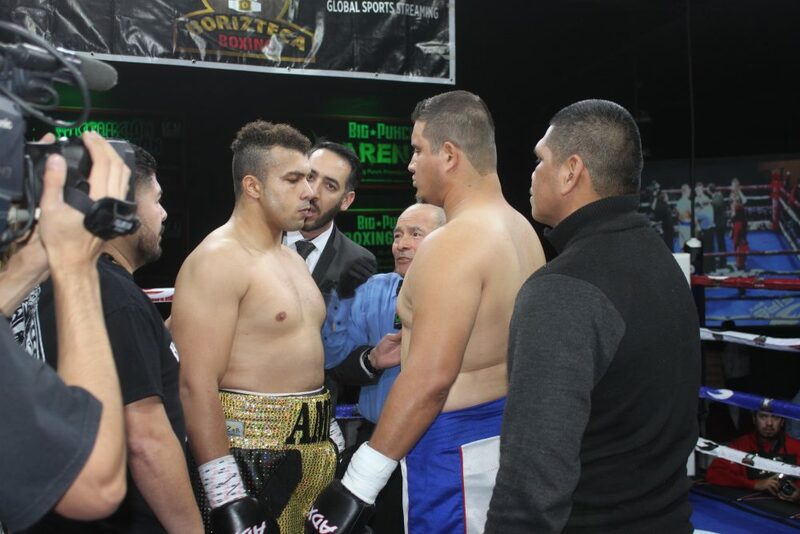 heavyweight Amir Elsaey from Los Angeles, Calif. in his Pro Debut battle the much taller 239 lb. Jair “El Huracan” Amaral Global ID 781202 (0-1) from Navojoa, Sonora, Mexico. To be fair, both boxers should be considered rookies. 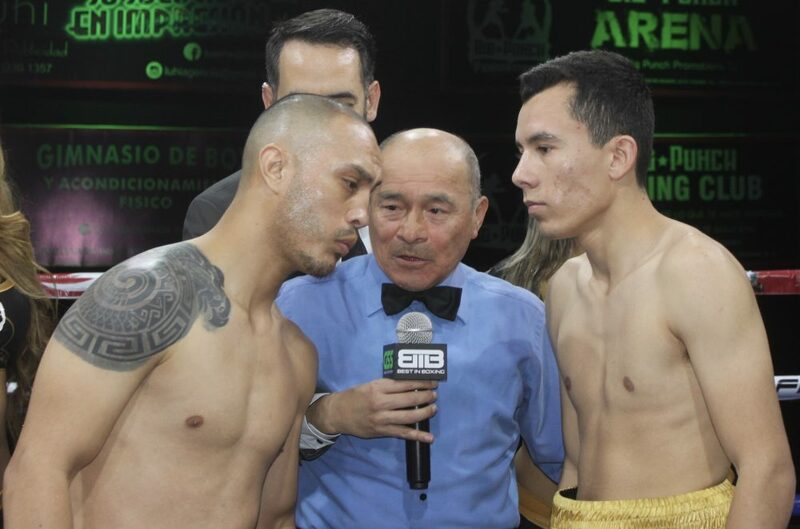 Amaral’s first and only fight took place two years and 45 days ago, back on November 25, 2016, against a seasoned boxer, Hector Aguilar, who at the time had a record of 6-1, with 5 KOs. That fight didn’t make it past the first round. 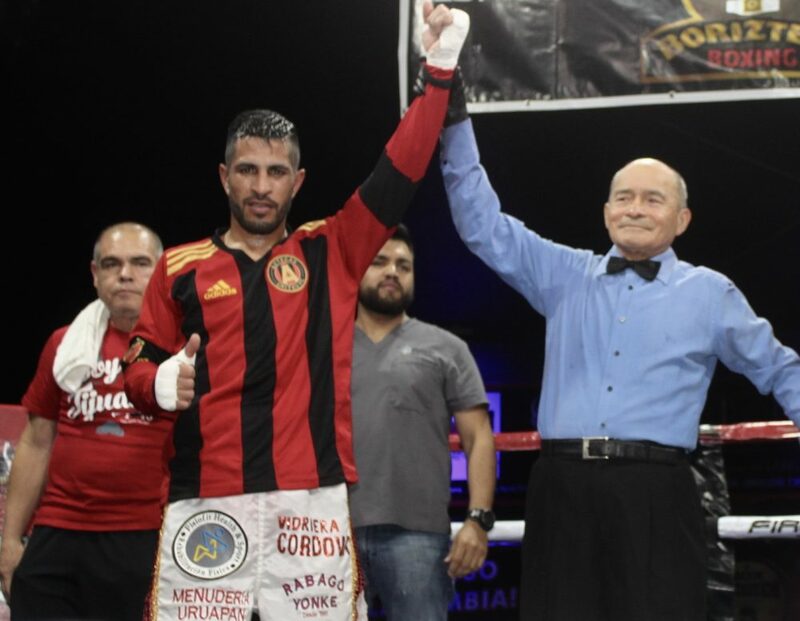 In Friday’s contest with Elsaey, Amaral once again looked raw, inexperienced, as the wild punches went flying in every direction and his hands dropped to leave him defenseless. 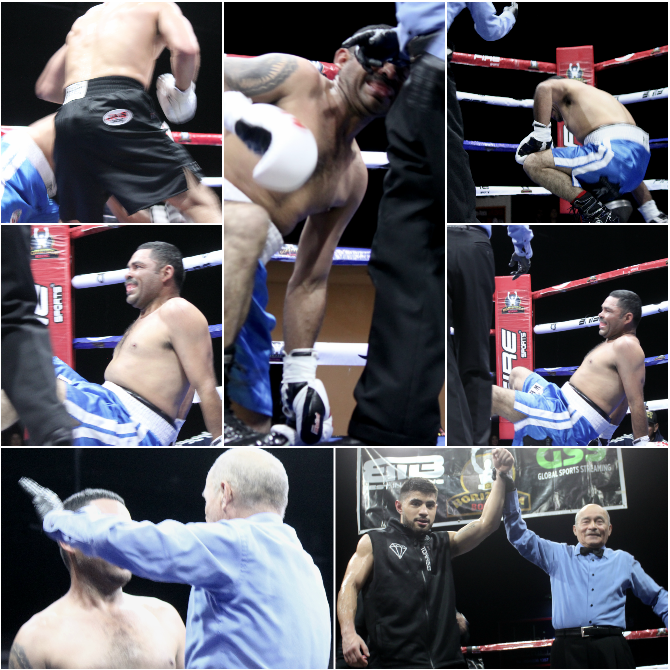 After Amaral went down twice and then took several power shots to the head, referee Juan Morales Lee stepped in to call a halt to this chaotic fight of the Big Boys. 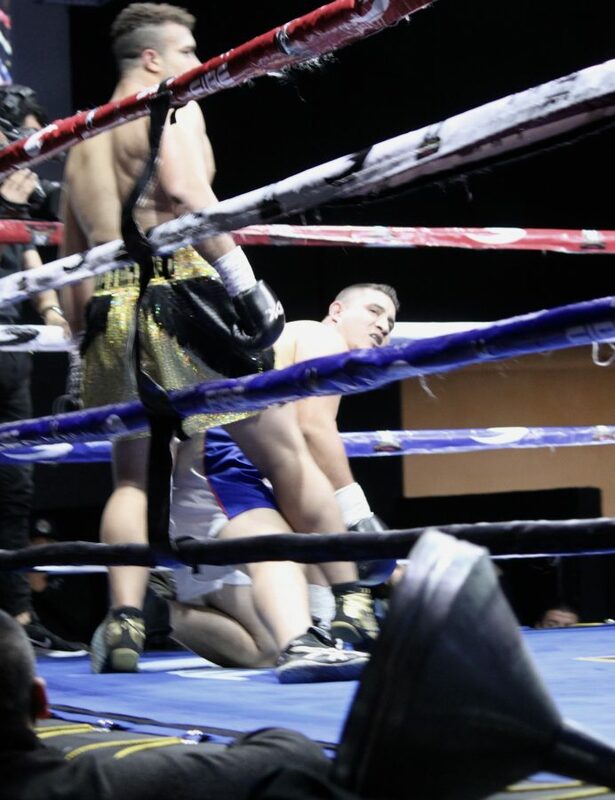 After going down at least twice and being pounded multiple times by Amir Elsaey, referee Lee alertly stepped in to stop the bout. 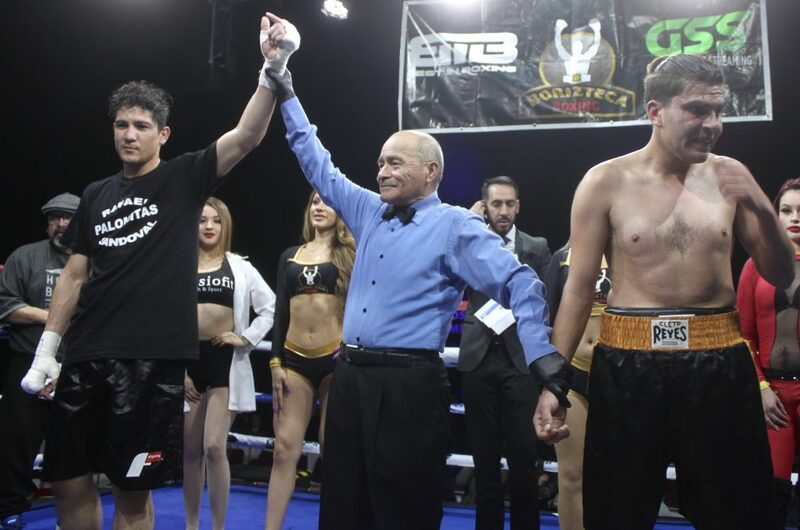 In the end, it was heavyweight Amir Elsaey (left) in his Pro Debut having his arm raised in victory after defeating Jair Amaral (r). 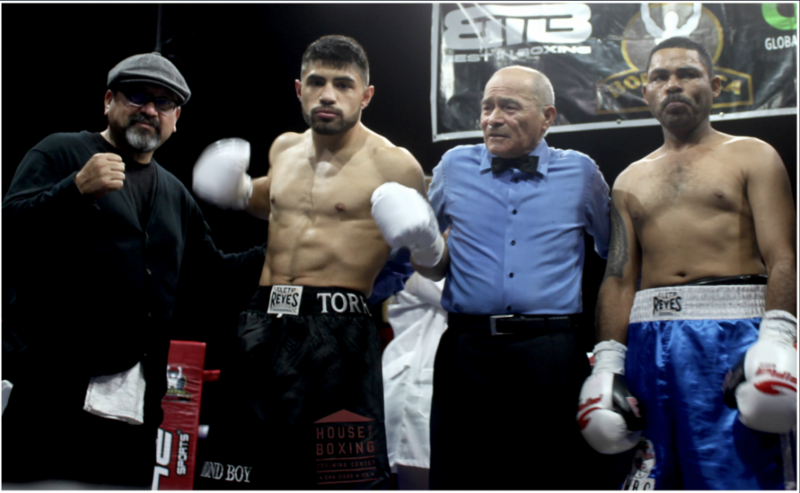 Bout #3 participants, flyweights, included 22-year-old, 5’7″ tall Marco Antonio Arroyo (1-0) Global ID 849109 from Stockton, Calif. (left) and 25-year-old, 5’3″ tall Cesar Alberto “Tokio” Martinez (0-3) from Tijuana, Global ID 843367, meeting in the center of the ring to receive final instructions from veteran referee Juan Morales Lee. 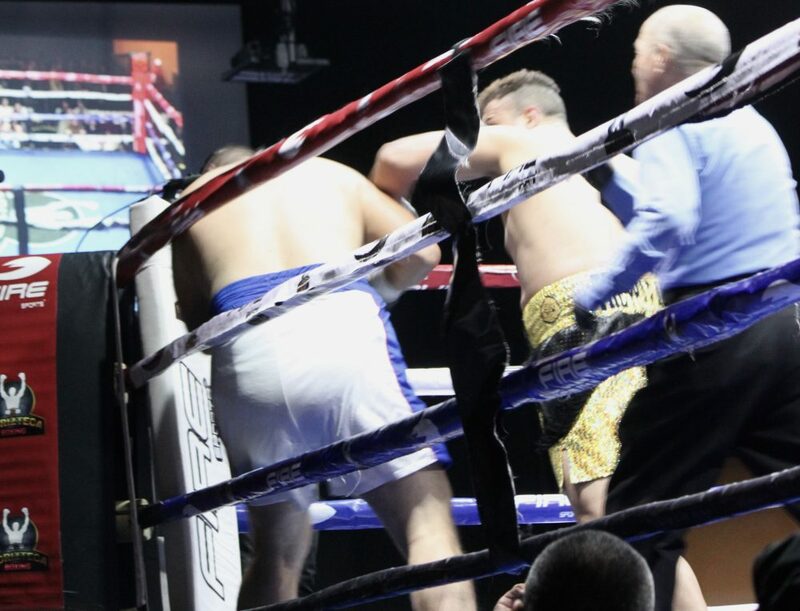 Getting the worst of it, Cesar Martinez (white trunks, black stripe) is seen grabbing and holding his opponent, Marco Arroyo, until the referee finally came forward to give Arroyo some relief. It was easy to see who held the upper hand in this bout. By maintaining his distance from the shorter brawler, the long armed Arroyo stayed in complete control of the fight. 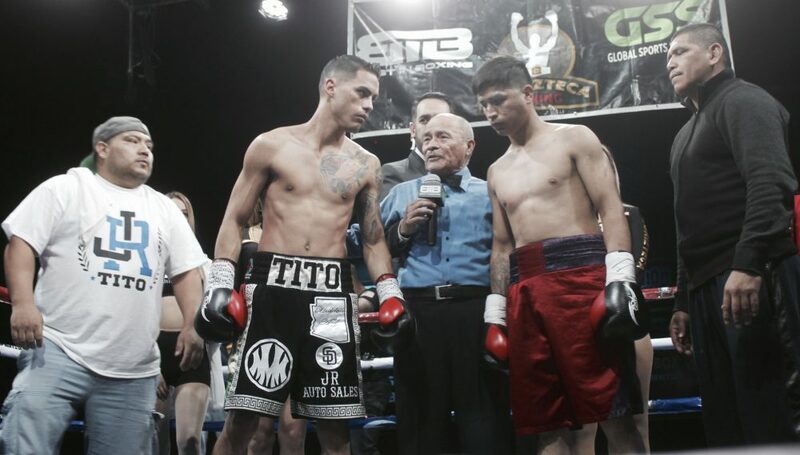 With the win, Marco Arroyo (left) improved to 2-0 while Cesar Alberto Martinez remained winless dropping to 0-4. 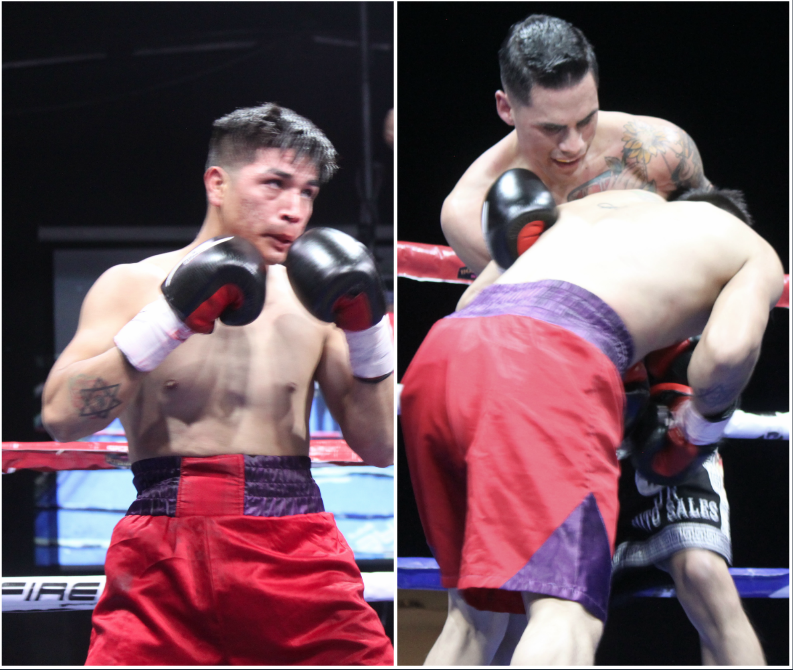 In Bout #4, they had middleweights Jesus Rafael Sandoval Garcia, alias Palomitas (left), Global ID 823057 from San Diego’s House of Boxing by way of Ensenada, B. C., Mexico (1-0) taking on Abraham Yocupicio (0-7) from Tijuana, Global ID 760083. We have to admit, this one was a clunker and Abraham Yocupicio should seriously consider taking up another sport. 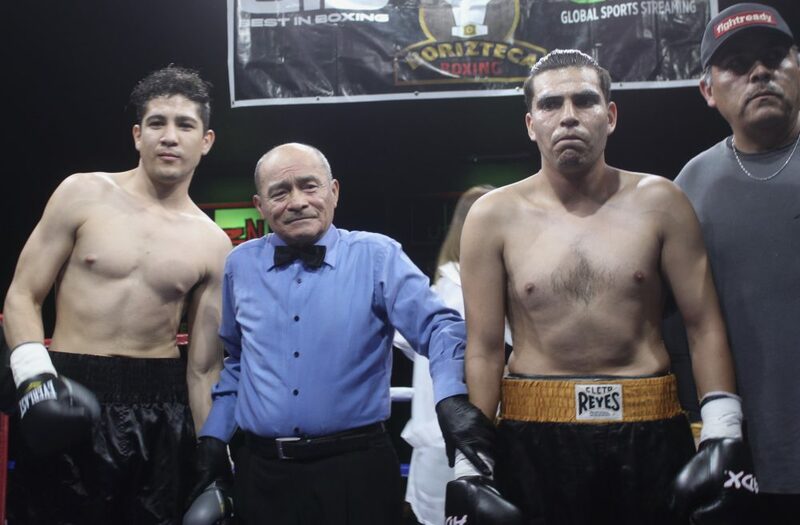 Before the start of Bout #6, we see the combatants, Jorge “Tito” Ruiz Jr. (11-3, 5 KOs), Global ID 634691, (left) from San Diego and Jose Eduardo Poom (2-17-1), Global ID 711604 (right) from Empalme, Sonora, Mexico meeting in the center of the ring to receive final instructions from referee Juan Morales Lee. Ruiz is now looking to get his career back on track after taking time off to recover from a serious illness. 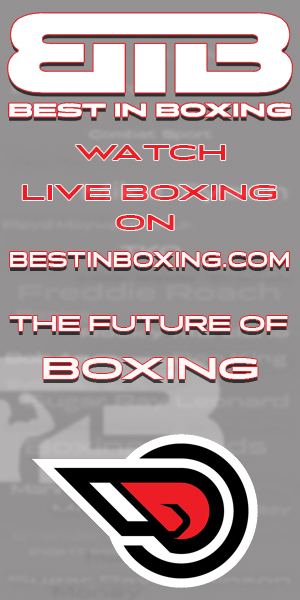 Ruiz had a lung infection that wouldn’t allow his body to compete at a professional level. 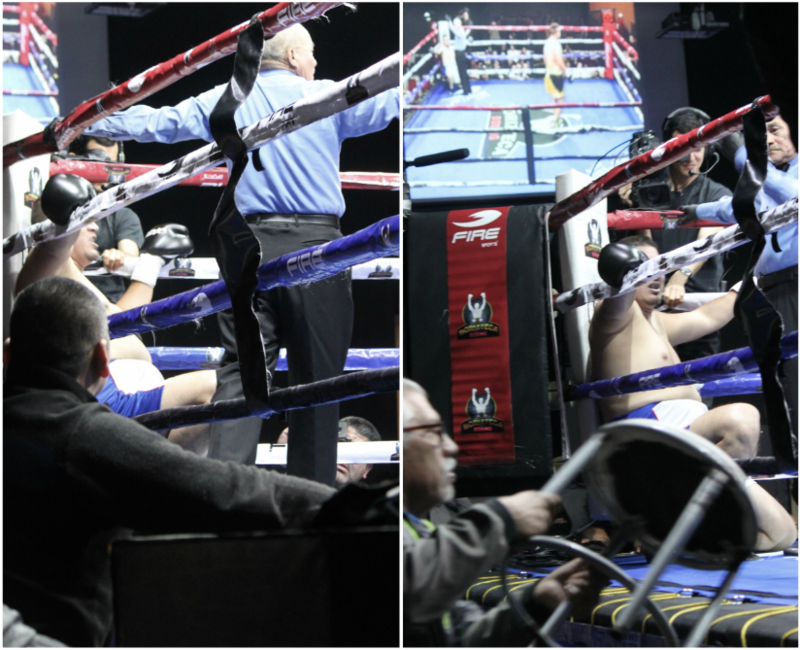 In Bout #5, Jose Poom was willing to use every trick in the book to defeat Jorge Ruiz Jr., even if it meant receiving a point deduction. After all else failed, it was time for Poom to use his acting skills. One complaint involved his leg, another being hit on the back of the head, even though this was one of Poom’s earlier tactics. 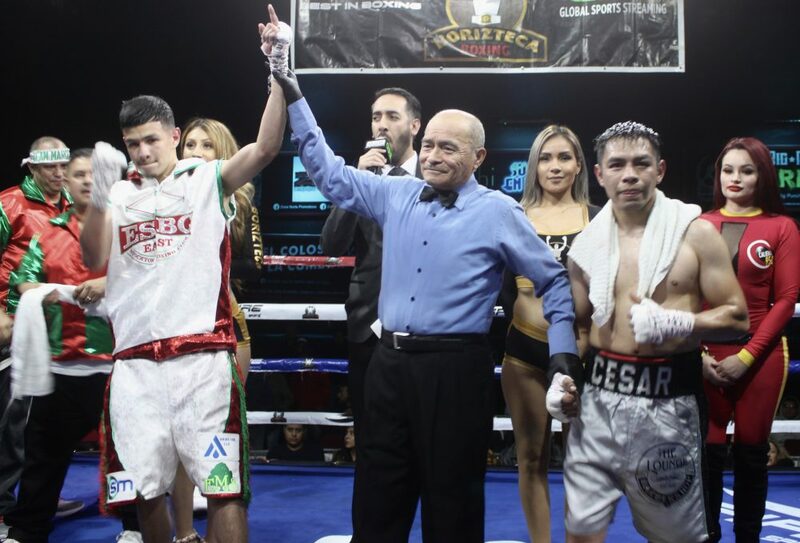 In the end, it was Jorge Ruiz Jr. winning by a unanimous decision to improve his record to (12-3, 5 KOs), while his gutsy opponent’s record dropped to (2-18-1). 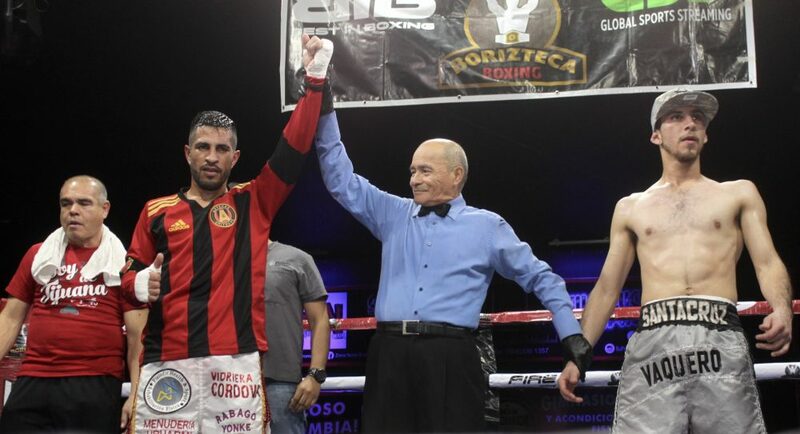 In Bout #7, you had to feel some empathy for Manuel Valenzuela (r) from Navojoa, Sonora, Mexico, Global ID 281937, record 4-30, after all, he was to be the first person to face Kevin Torres (10-1-1, 9 KOs), Global ID 775110 after Torres suffered his first loss on 11-09-18 to the much taller lefty Jorge Alberto Brito. Plus, there was no way he could beat Torres, and fighting Torres only made it appear as if he had suicidal tendencies. 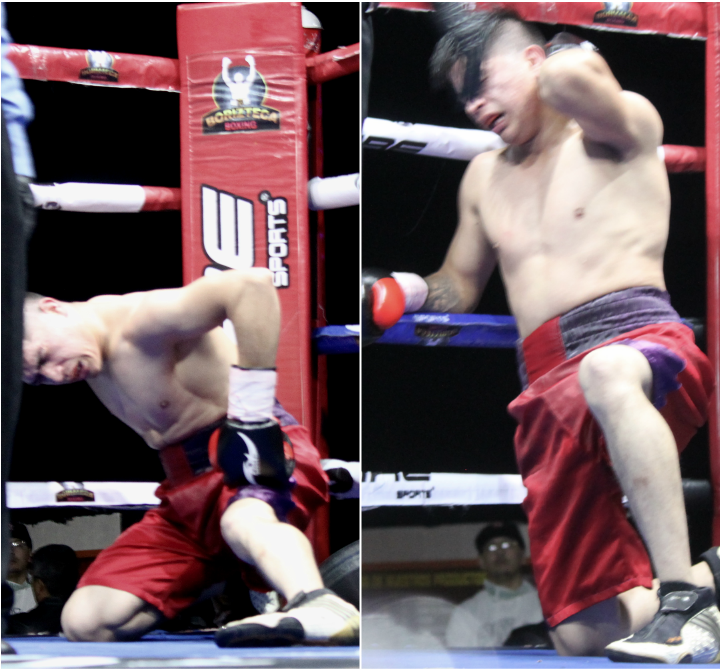 In the end, Valenzuela took the fight and got battered as they say from pillar to post. You don’t always have a say-so in who you are about to fight. Just like the famous Marshall Wyatt Earp of Dodge City who was “Brave, Courageous and Bold” Manuel Valenzuela took this fight and then somehow managed to survive. 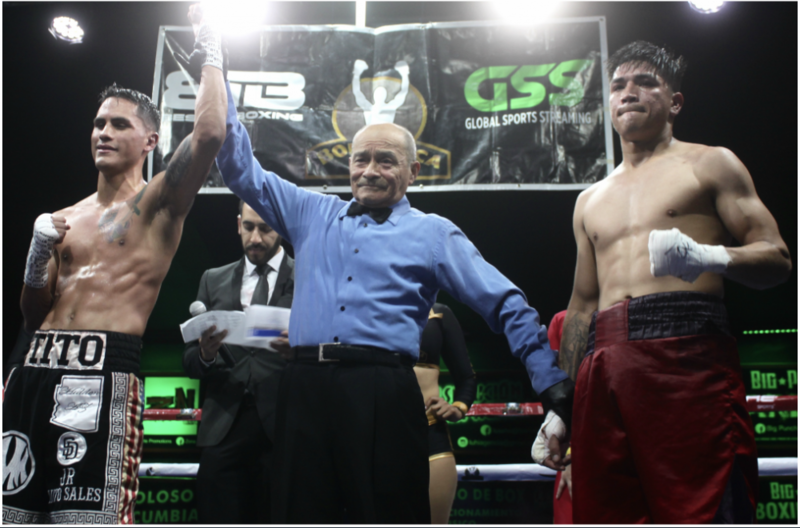 With the win, Kevin Torres (l) improved to (11-1-1 with 10 KOs) while Manuel “Petrolero” Valenzuela (r) dropped to (4 wins 31 losses, with 3 KOs). Next, we have some absconded photos from Carina Moreno’s personal Facebook page. Photos that speak volumes of her unquestioned beauty. 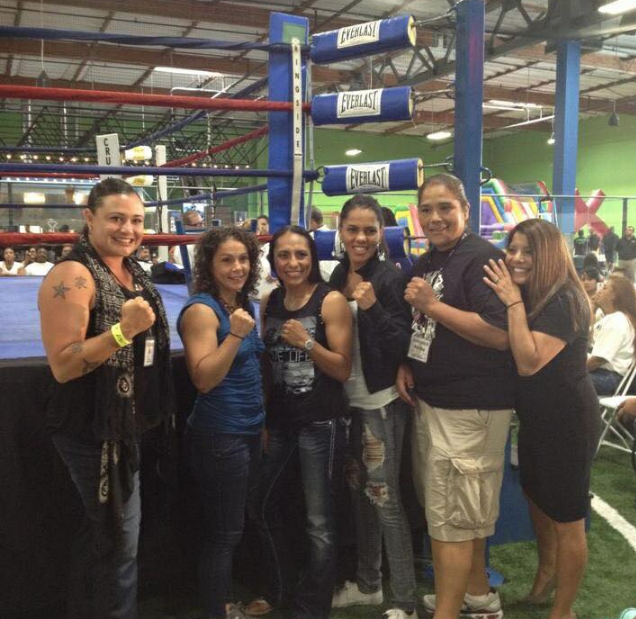 Eliza Olson, former IBA and WBC World Lightweight Champ, Melissa McMorrow, former WBO Flyweight World Titlist, Carina “La Reina” Moreno, former WBA Flyweight World Champion, Ava Knight, former IBF World Flyweight Champion and finally Martha “The Shadow” Salazar (13-5, 3 KOs) the 2014 Heavyweight Champion and presently, the current #1 ranked contender. 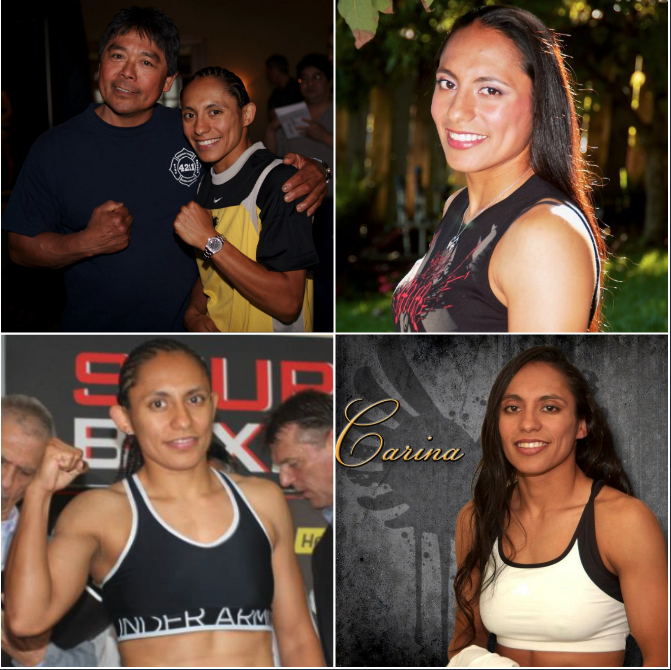 In Bout #8, they featured the former Female Flyweight/Minimum weight World Champ Carina Moreno (23-6) Global ID (200991) from Watsonville, Calif. who was being challenged by upstart Judith Vivanco (4-2-1) Global ID 780372, from Mexico City. 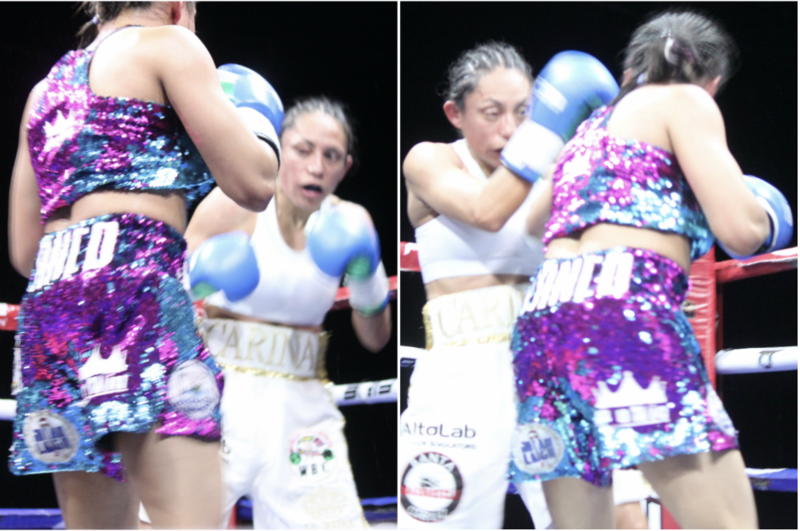 With Moreno being an all action fighter that always leaves the fans satisfied with her performance, Friday’s patrons were totally engrossed in this fight with Judith Vivanco who also showed a lot of heart to keep banging with Moreno right up until the final bell. 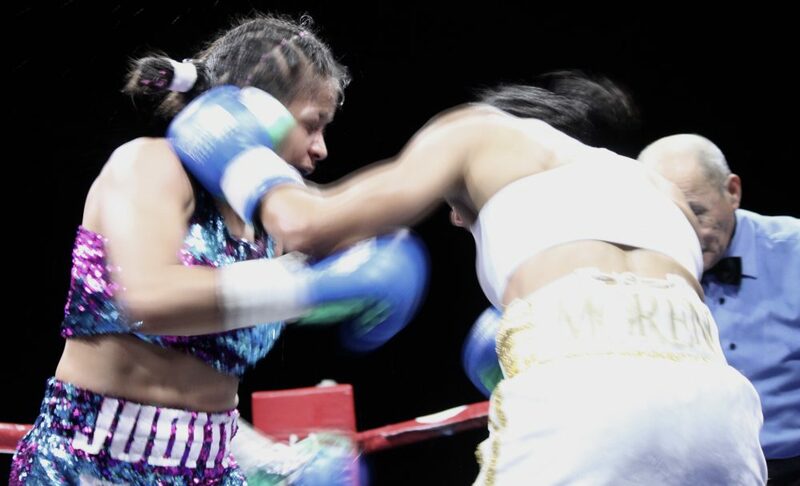 The punches never stopped as the young ladies kept banging away with the majority of these punches going to the opponent’s head. 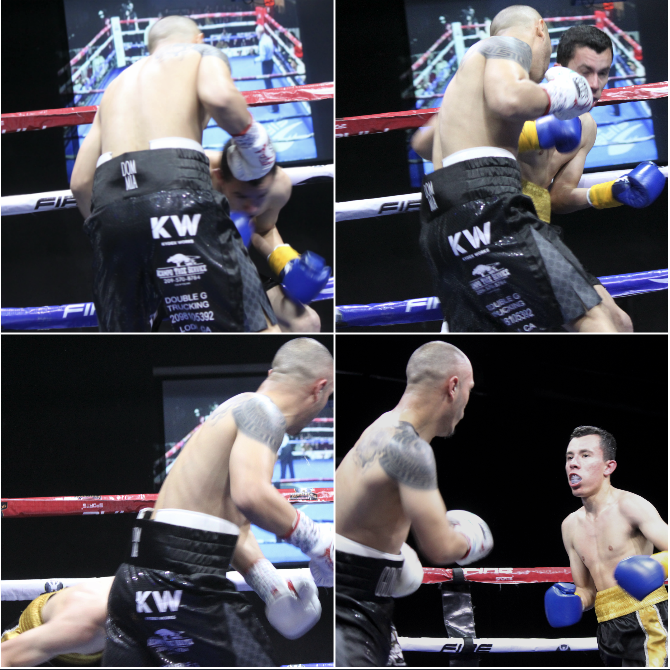 On both of their faces, especially around the eyes, you could see the hard punches were taking their toll. On Judith Vivanco’s forehead there were two unmistakable, raised welts. 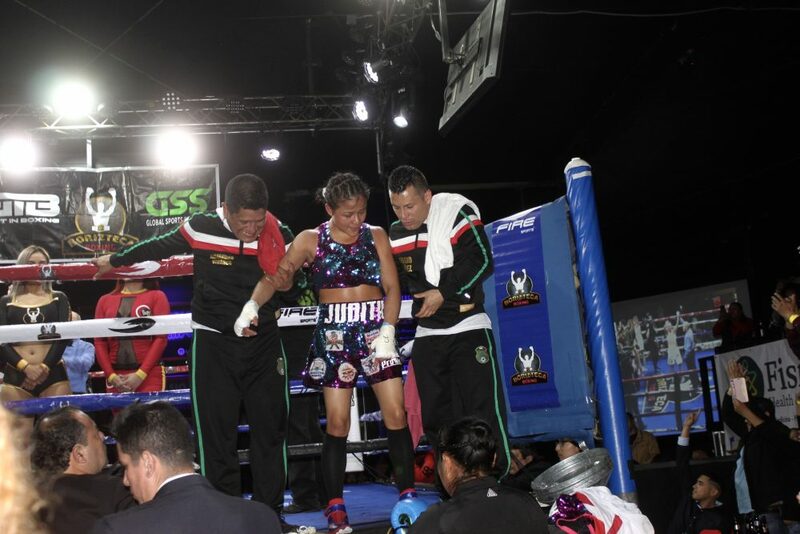 After Carina Moreno (r) clobbered Judith Vivanco, back came Vivanco to return the favor. 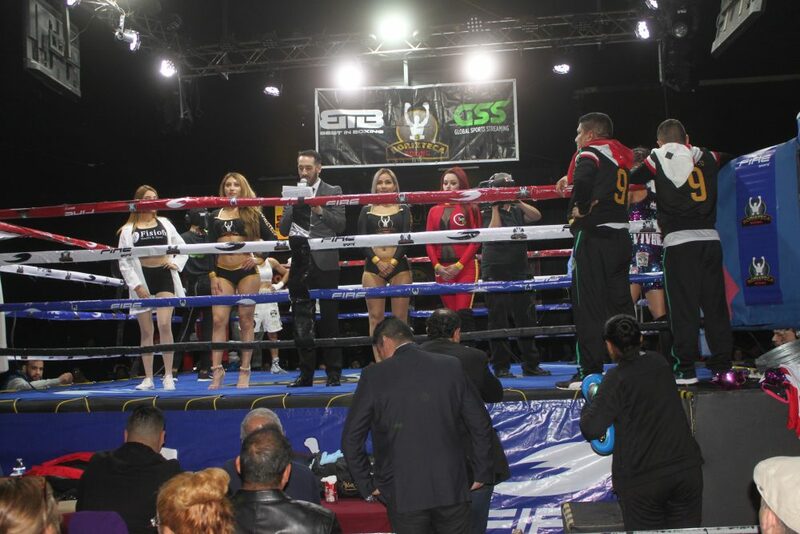 Announcer Pablo Flores (center) prepares to give the scores from the Carina Moreno versus Judith Vivanco bout. After learning of the unfavorable scores, an angry Judith Vivanco (center) immediately heads for the locker room. 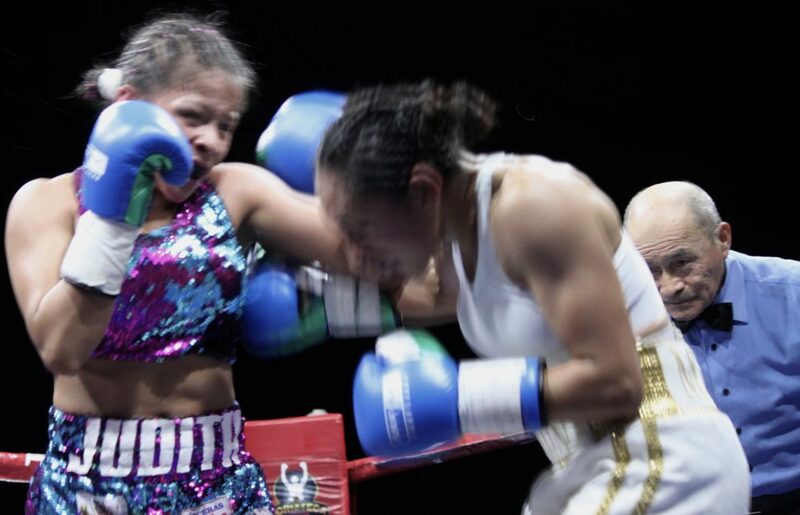 Knowing that we still needed a photo of Carina Moreno with her opponent showing who won this match, we lucked out as this photo shows an escaping Vivanco plus the TV screen, (lower right) which has the referee raising the arm of the victorious Carino Moreno. 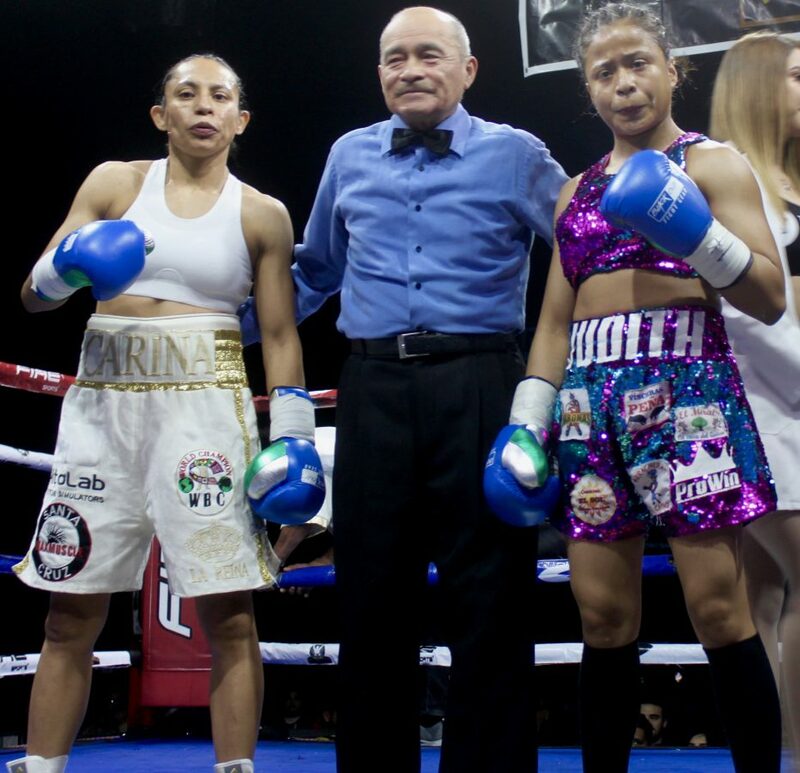 After taking that first photo of Vivanco leaving the ring without waiting to have her photo taken with the winner Carina Moreno and the referee, we ran back over to the right side of the ring to have Moreno and the winner Carina Moreno pose for another photo. Below, the winner Carina Moreno is shown being interviewed by lead announcer Marcos Villegas. 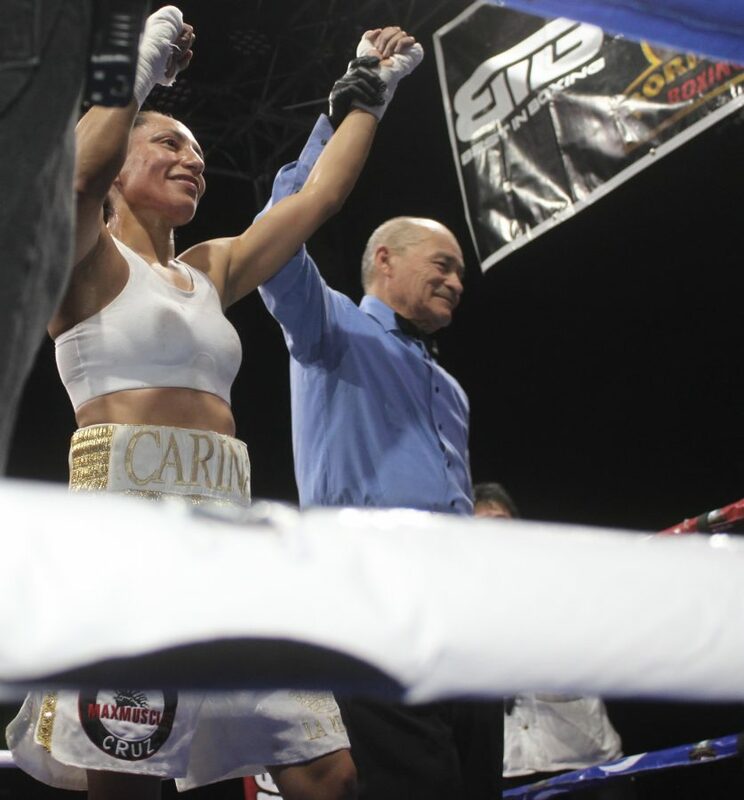 After being declared the unanimous decision winner over Judith Vivanco, Carina Moreno was asked her thoughts about her victory and comeback after the knee surgery in mid-October of 2015. 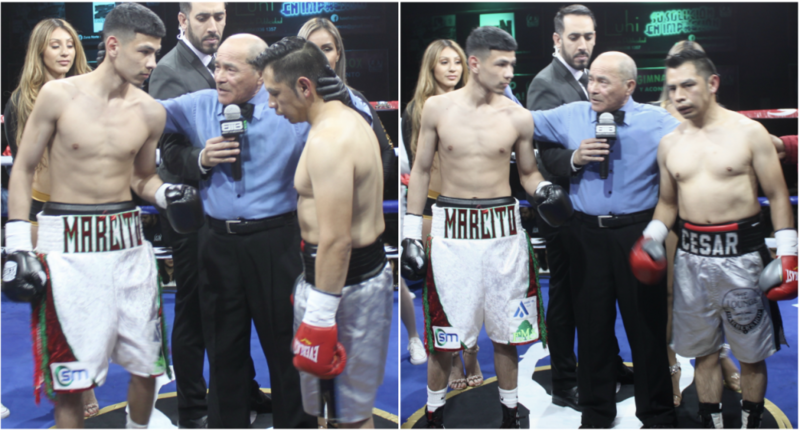 Prior to the final bout of the evening, Bout #9, boxers Angel Viedas of Tijuana, Rec: 22-9-1 and Manuel Sandoval join referee Juan Manuel Lee in the center of the ring for last minute instructions. 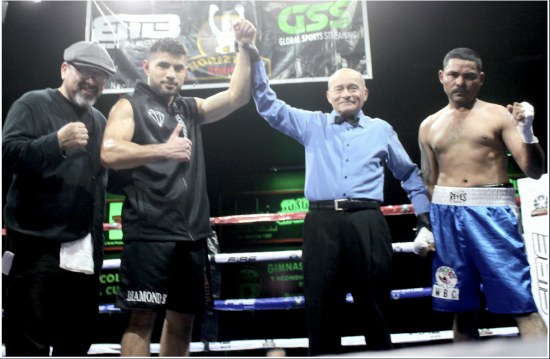 After his rigorous, nonstop battle with Manuel Sandoval, Angel Viedas was declared the unanimous decision winner.